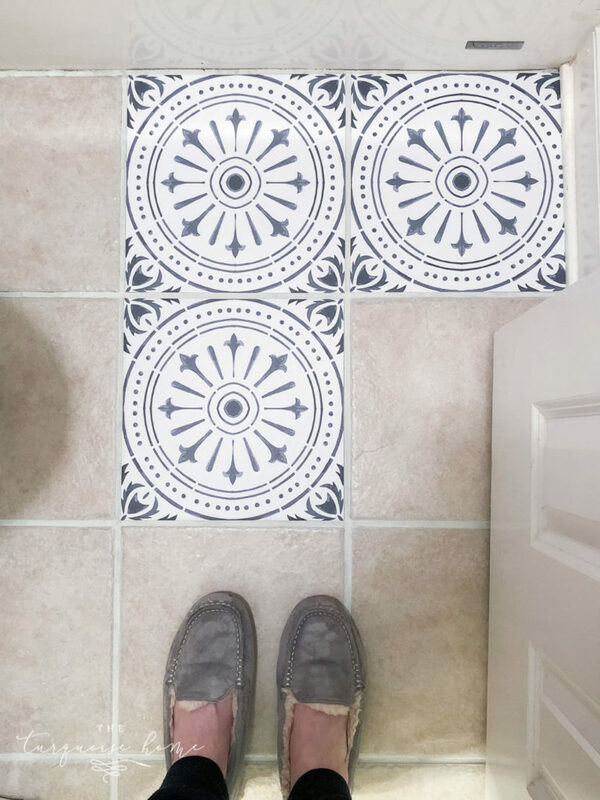 Learn how to apply DIY peel and stick vinyl floor tile and the pros and cons of using it in your home. 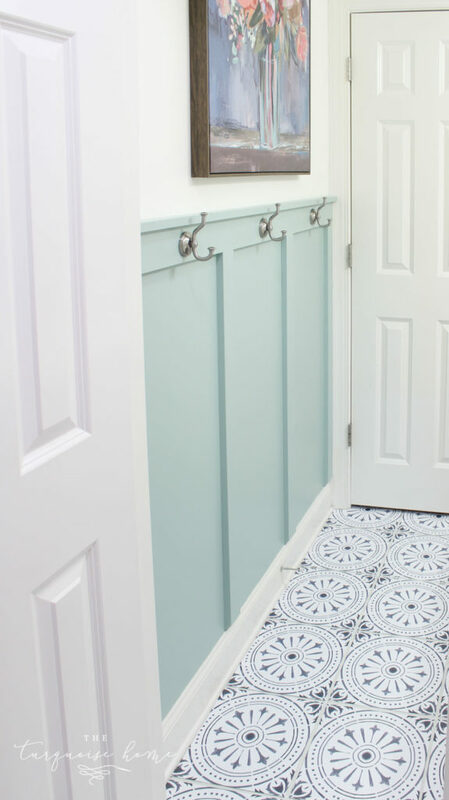 It is a great solution for a budget-friendly DIY flooring idea: cheaper than replacing the floors and less messy than paint! Before the tiles… all the beige floors in the house! I’d already painted these cabinets years ago! Since we moved into our home with it’s beige floors, beige walls and beige cabinets, I’ve been on a mission to change things up! We have the same exact beige tiles in both of our bathrooms, our laundry room and it’s even the tile on our fireplace. Nobody got creative when building this house, that’s for sure! Or, do anything too complicated. I decided to use them in my girls’ bathroom refresh first to get my feet wet. It’s a small space and it’s for our guests as well, so I wanted to do something fun in there that everyone would see and enjoy. It took me a little bit to decide on the style I wanted because there are just so many great options out there. 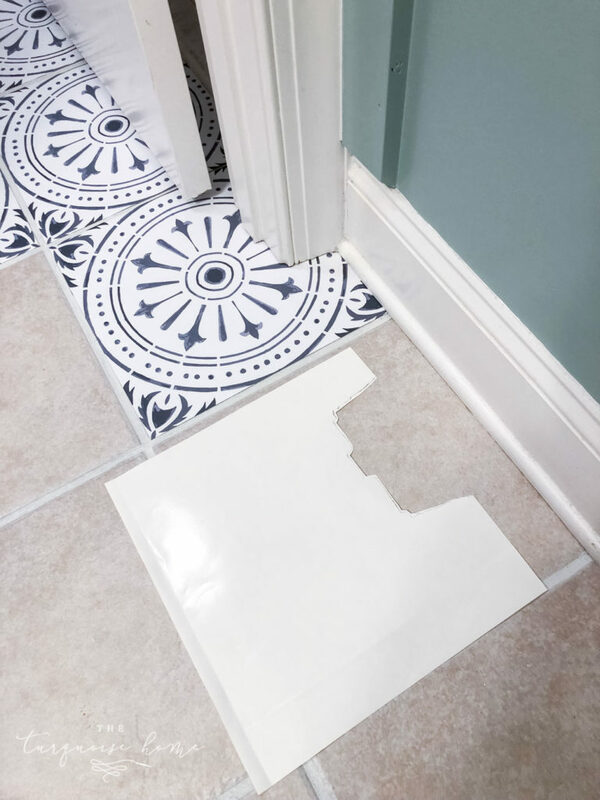 I outlined my favorites in this post with 25 options for varying styles of peel and stick vinyl tile flooring. 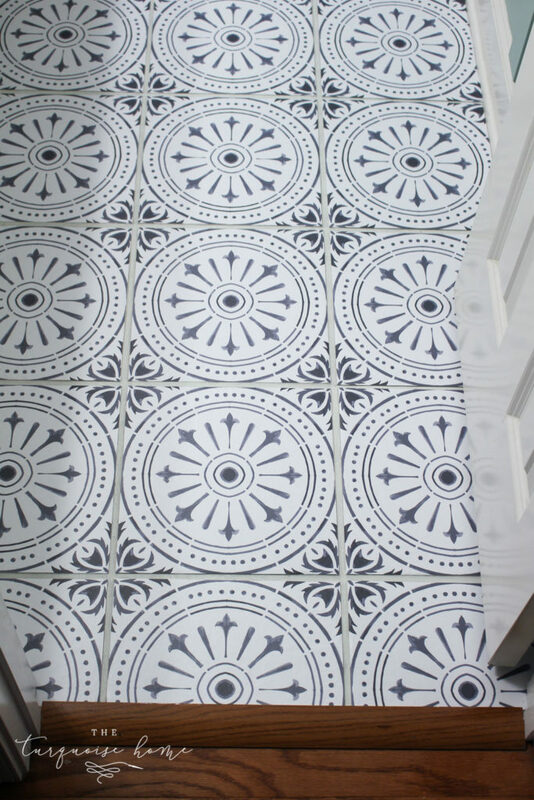 And I finally narrowed it down to this naples tile (click here). Measure your tiles inside the grout lines. Do not include the grout lines in your measurements. The Etsy shop I ordered from can make your tiles the exact size you need at no extra charge (at the time of this posting). 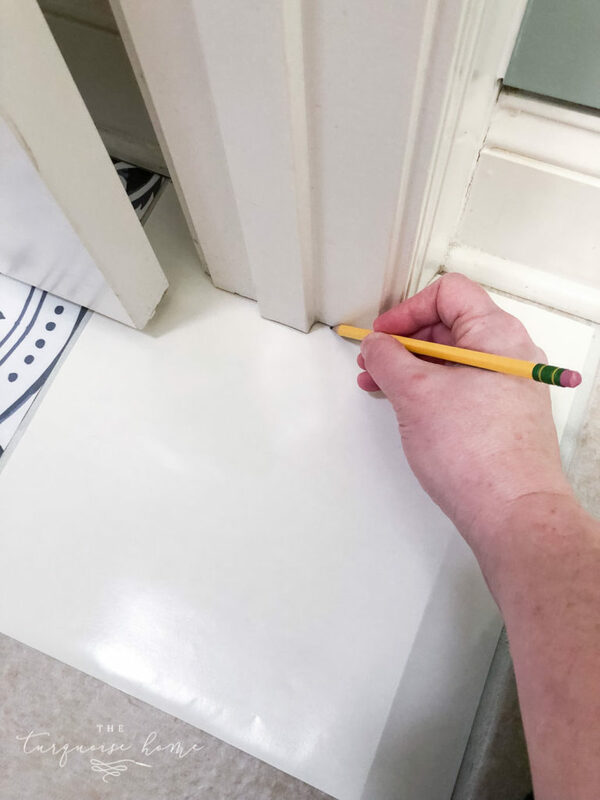 Keep reading to find out my exact experience, but in my opinion, you will want to make sure your surface is level before you use vinyl tiles. My tiles were beveled on the edge, which caused me some grief. So, keep reading too make the most informed decision about what tiles to order. ** Be careful to read all of the instructions given to you by the store you buy from in case there are additional prep items. 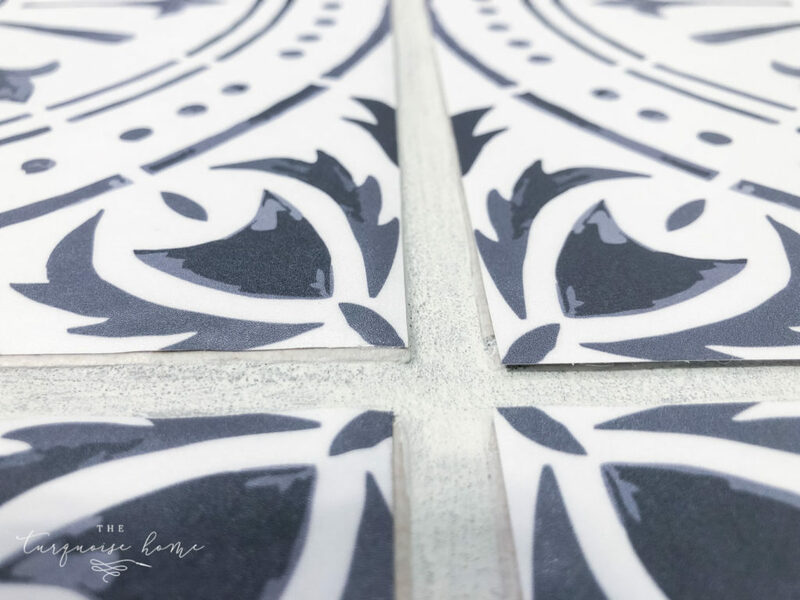 Vinyl tiles (of course) – I gathered up my favorites in this post (click here), which will give you an idea of all the different options you have out there! You can use them on most any surface (like a backsplash, too), but be sure if you plan to use them in a wet area that they are safe for a kitchen and bathroom, etc. I used this tile (click here). 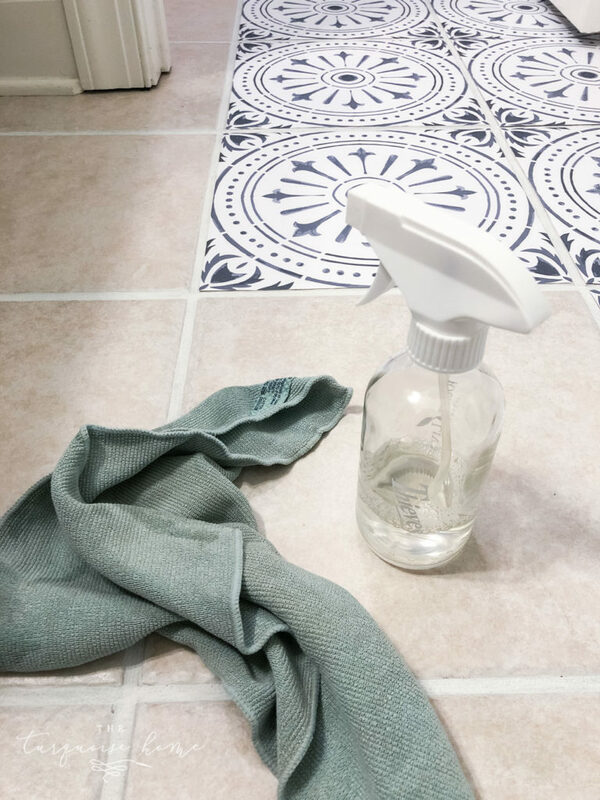 Cleaning spray & cloth – I used my Thieves cleaner from Young Living, but you can use any kind of Krud Kutter or other degreaser for cleaning each tile. Scissors or Box Cutter – I used scissors to cut my tiles. 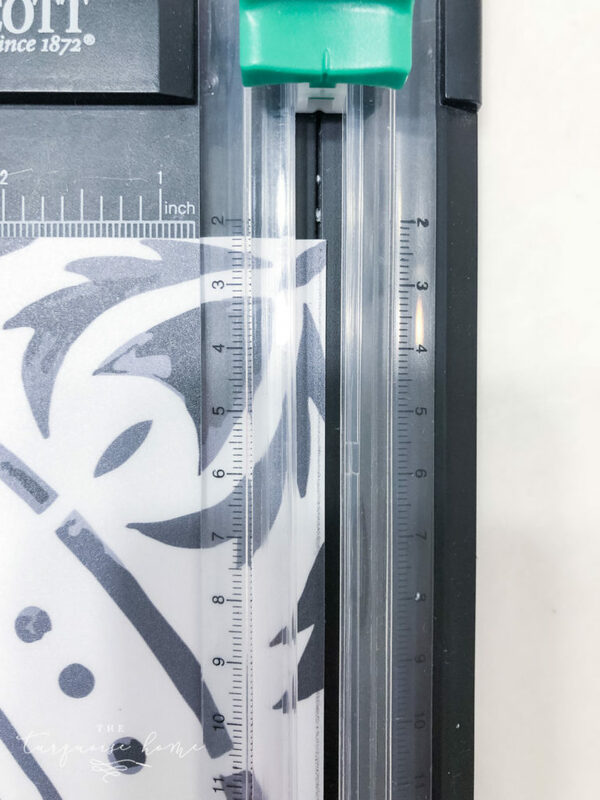 Paper Cutter, optional – I used mine quit a bit for cutting straight lines, but scissors would work fine, too. 1. Clean your tiles really well. I clean the whole floors first, and then I vacuumed each tile with my stick vacuum and wiped it down with my cleaner before each tile I placed down. Make sure to let the cleaner dry before you apply the vinyl tile. Love my Norwex cloths and Thieves cleaner! 2. Peel back a small strip of the backing and then place the vinyl tile down in place. I found that if you messed up, you could quickly pull it off and reapply. Once the strip is stuck down, peel off the rest of the backing and smooth it down. Work out any bubbles that might have gotten trapped in there. 3. It’s not a bad idea to use a wallpaper smoothing tool to go over each tile and press the bubbles out. I used my hand and sometimes would use the side of my paper cutter to go over it. I found they stuck pretty well. 4. 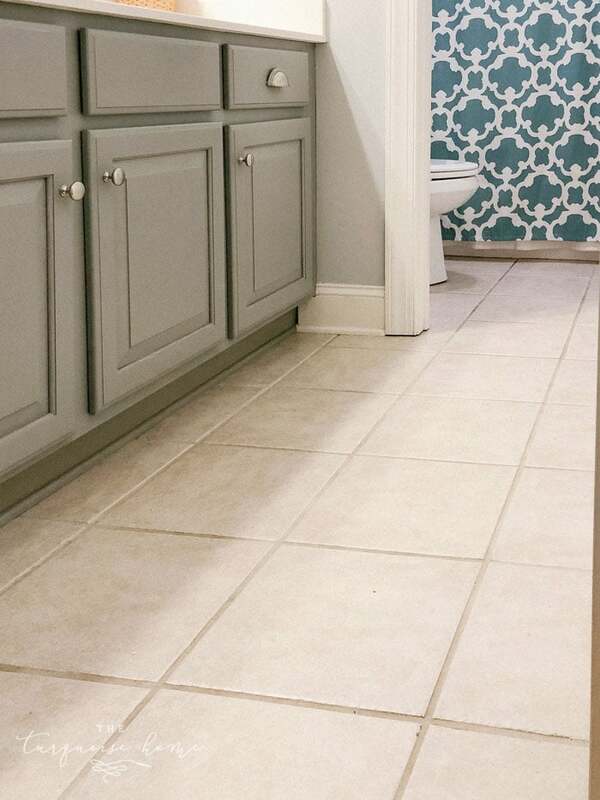 Trace out unusual angles or corners or around trim pieces with the back of a used tile. I would use the paper backing of an old tile and trace out where I needed to cut. And then just cut the tile with my scissors. If the trim didn’t touch the floor, I left about 1/8th of an inch inside the cut line so that the tile would fit under the trim piece. That’s all! It’s a super simple process and easy DIY for a big impact! First of all the vinyl tile was great! The owners of the Etsy shop cut the tiles perfectly and shipped them to me quickly. No complaints there. But my issues happened when I realized that my tile on my floors were slightly beveled on the edges. The vinyl tiles aren’t meant to wrap around the tiles, so the edges wanted to pop up a bit. My ceramic tiles are also a little bit textured, which was fine on the flat part, but made it difficult for the vinyl tile to grab the beveled edges. After I put down the first row, I realized that the edges were going to come up too easily and that I didn’t think it was going to work. So, I found that if I trimmed off 1/8 of an inch from two perpendicular sides (keeping the tile square, just a 1/4 inch smaller), then my vinyl tiles would cover most of the ceramic tile and wouldn’t have to bend as much on the edges. Does that make sense?? If my tiles were completely flat, this wouldn’t have been as issue. The tiles on the left were trimmed smaller than the tiles on the right, so you can see how they look like the overhang on the right. And honestly it may not even be an issue. I haven’t had them coming up at all, but my fear is that someone or something is going to catch a corner of a tile and it’s going to just peel off. Only time will tell – and I WILL do a follow up in probably a year to see how they’ve held up. But in the meantime, I’m just waiting for one of my kids to come yelling that they’ve lifted one off the tile. Maybe I’m just paranoid? We’ll see. Like I said, so far, so good. 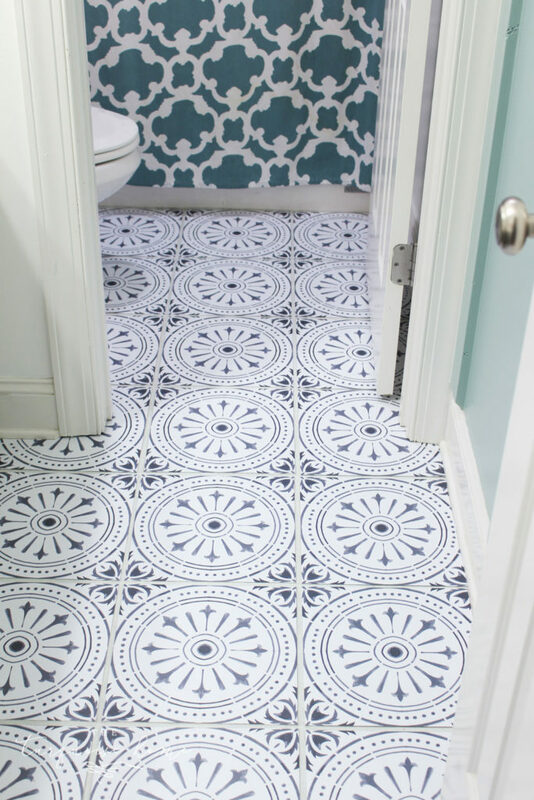 I would have leveled the floor by filling in the grout lines with thin-set mortar or leveling compound and getting the grout lines printed on the vinyl tiles. I think the peel and stick vinyl tiles are fabulous! I would 100% use them again in my home. But I think they would be best suited for covering a flat surface, either linoleum, flat tiles, wood or a floor that has been leveled. They ARE so pretty – aren’t they?! 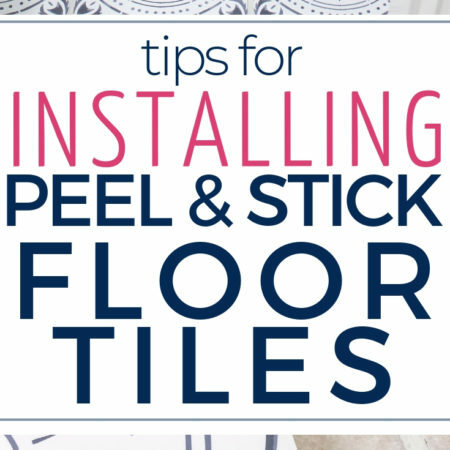 Have you used peel and stick tiles in your home? Or do you want to use them in your home?? Leave your thoughts and experience, tips and tricks in the comments below! Want to See More of the Bathroom Plans & Projects? I love the tile pattern you chose and they look fabulous in your bathroom. I have used peel and stick vinyl ‘wood’ planks before in our garage converted den. There are definitely some pros and cons. Pros: I did it all myself with no help. No power tools required. Cost was way less that any other flooring. Cons: it cannot get wet! A little spill or quick swipe with a damp mop is fine, but a washer hose cane off and soaked the flooring once, and my cats are constantly knocking their water bowl over. Those water accidents weren’t caught right away and the water has caused some planks to come loose. Luckily I have an extra box and can replace those pieces, but at the same time – shouldn’t it be just a little more durable? Also a few pieces have gotten scratched from moving furniture and will probably need to be replaced. Ultimately I’m still pleased with our flooring after almost 2 years, but I’m not sure I would go to his route again. The builders of our house must have had the same ideas as yours! We have those EXACT beige tiles throughout our first floor. On our fireplace, too! And beige walls. And carpets. You absolutely KNOW what I am talking about, ha! Those look great, and would totally go with what I am envisioning for our downstairs bathroom, but I am concerned with dog hair getting underneath them. I am so happy you mentioned the beveled edges, since that it what we have, also. I still wanna give it a try. Plus, the peel and stick will probably appease my change-averse husband! Haha! I know exactly what you’re talking about with the beige everything. So blah! But I guess the safe solution when building a new house?? Anyway, the hair will probably get under them. But just know what you’re getting into! They look great and I’m loving them for now! We’ll see how they hold up after a year or so! Laura, they certainly LOOK great. I’m wondering if the overhang ones are gonna get crud stuck under them as you try to sweep. And what about mopping? Those are by far my biggest questions. But again, they look fantabulous. Now just dont let anyone actually use the bathroom and you’ll be good to go. I plan on vacuuming in there with my beloved Dyson stick vacuum so that hopefully things will be sucked up instead of swept under those edges. And mopping?!?! I don’t even know how that will work. I’ve heard from some friends that they mop theirs just fine. I haven’t mopped mine yet, so we’ll see! You’ve got me wanting to try this on my fireplace. Hmmm…I’m not sure the adhesive would stay long term with the heat from the gas logs. 🤔 Your bathroom looks great! I’ve wondered the same thing about mine because we have gas logs, too. But I think it might be likely to stay put better on the wall than on a bathroom floor. Wow Laura – these look great!! And I love your detailed tutorial and pictures. I now feel inspried to consider these for my yucky linoleum floors. But first, the mood board… ahhh. One thing at a time, right? Anyway – your bathroom refresh is looking so fresh and pretty! Kudos to you for making steady progress, and for knowing when to change direction midstream (board & batten, which is GORGEOUS!) to allow the creative process to function. I was going to tell you this earlier… just to share my insight… when doing something creative, you must have a plan, or nothing will get done, or at least it won’t get done in a cohesive manner. But if the “CP” stays too rigidly within the plan, then it won’t be creative at all. I think you were very wise to pause when you felt inspiration, listen to that inspiration, and then adjust your plan to act on it. Please don’t feel bad for having made this change. The results were worth a change of course. Thank you for your blog – I am enjoying it so much – and keep up the great work! Jane. This is awesome! Laundry room here I come! Also wondering what paint product you used on the bathroom cabinets? I love that color and would love to do it in my kitchen. 🙂 Hope that helps! It’s a labor of love, but so worth it!! Oh I think it would work amazing as a backsplash!! I think you’re a genius to do peel-and-stick in a current trendy pattern! In 5-10 years when you want to change it, it won’t take a jackhammer!!! Your floor in gorgeous, I love your choices! What is the brand and color of your bathroom walls? It is so very pretty and fresh looking. The floor looks awesome and I’m sure no one else will even notice the bevel issue. You just happened to get a birds eye view of it! I enjoy your blog very much! The white color is Simply White and the blue color is Wythe Blue … both colors are from Benjamin Moore! I was wondering if these peel and stick tiles would work on the wall? Yes!! They are made to work on walls as well, and I think they’d work even better on the wall! I wonder how these would do on a concrete basement floor? I think they’d work well on a concrete floor! It’d be a smooth surface and you wouldn’t run into the same problems I did with the beveled edges on my tiles. Love the look! The pattern is so pretty. Great job! I’m curious to see how well they hold up …. I’ll keep everyone updated, for sure! I’ll probably do a 6 month and 1 year update post.